Black 77355. Autoart 1:18 Nissan Skyline R34 Z-TUNE. Only 1 available ! Nissan Skyline R34 V-Spec Silver. Autoart 1:18. Only 1 available ! You buy what you see. Nuevo, en su caja de corcho. Nissan Skyline R34 V-Spec II Police Japan. Autoart 1:18 77351. Only 1 available ! = low price for this rather rare model. Nissan Skyline GT-R R32 STP Taisan #2 1993. Make: AUTOart. Serial nr: 4030. AUTOart Straßen-Fahrzeuge Nissan. Fabricante: AUTOart. Los gastos de envío dentro de España Factura con IVA. Artículos bien protegidos y embalados. Sus ventajas. tarjeta de crédito. Türen zu öffnen. 1:18 AUTOart, 1978 NISSAN FAIRLADY Z432 (orange). coche a escala 1:18 de Diecast del fabricante AUTOart 1978 NISSAN FAIRLADY Z432 (orange). 1:18 AUTOart 77457, 2015 NISSAN JUKE-R (GLOSS RED). coche a escala 1:18 de del fabricante AUTOart 2015 NISSAN JUKE-R (GLOSS RED). Nissan Skyline GT-R (R32) - Bathurst Plain Body 1992. Manufacturer: AUTOart. Diese Kosten sind vom Käufer zu tragen. Maßstab: 1/18. Scale: 1/18. Manufacturer-part-no. : 89280. 1:18 AUTOart 77415, 1999 Nissan Skyline GT-R ( R32) Tuned Version (blue). coche a escala 1:18 de RESINA del fabricante AUTOart 1999 Nissan Skyline GT-R ( R32) Tuned Version (blue). 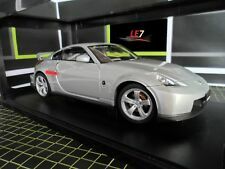 1:18 AUTOart, 1978 NISSAN FAIRLADY Z432 (SILVER). coche a escala 1:18 de Diecast del fabricante AUTOart 1978 NISSAN FAIRLADY Z432 (SILVER). 1:18 AUTOart 81579, 2015 Nissan GT-R Nismo GT3 Le Mans Matsuda Shuizhitskiy ordoñez. coche a escala 1:18 de composite del fabricante AUTOart 2015 Nissan GT-R Nismo GT3 Le Mans Matsuda Shuizhitskiy ordoñez. Nissan Skyline R32 Autoart 1/18. El estado es Nuevo. Enviado con Correos: cartas certificadas. 1:18 AUTOart Nissan Skyline GT-R R32 Plain Body blue. DHL Paket: 5,95 EUR pauschal (Optional: Abholung 0,00 EUR). DHL Premium Parcel: 14,95 EUR. Weltweit/ Worldwide. Zustand/ Condition: NEU/NEW. Autoart Nissan GT-R R35 V Spec Opal Black 1:18 Superb Condition Kept In Showcase. Zustand: Gebraucht Versand mit DHL Paket bis 2 kg. Référence Fabricant : 77457. - Fabricant : AUTOart. - Type : NISSAN JUKE R 2.0. - EAN : 0674110774573. Sie gehen zu Lasten des Käufers. Vorbild/Original: Nissan GT-R Nismo GT3. Beachten Sie die Altersempfehlung 15 / The product is not suitable for children under 3 years because of sharp edges or breaking off of small parts. Miniature avec sa boite d'origine. Nissan Skyline R34 GTR. Last R-Tune / red R34 available from my JDM collection ! 1:18 Autoart 77357. New in box, never displayed. 1:18 Autoart 80279. Nissan Skyline R34 GTR Gran Turismo Version. Beautiful and Rare Model ! With Original Box. Only 1 available ! D'autres photos se trouve en bas de l'annonce. Farbe / Colour: silber / silver. NISSAN SKYLINE GTR (R32) V-SPEC II. Maßstab / Scale : 1:18. Beachten Sie die Altersempfehlung 15 / The product is not suitable for children under 3 years because of sharp edges or breaking off of small parts. Vorbild/Original: Nissan Juke R 2.0. Sie gehen zu Lasten des Käufers. Das Modell ist gebraucht, aber mängelfrei. Farbe / Colour: grau-matt/ grey-matt. NISSAN GT-R NISMO GT3. NISSAN GT-R NISMO GT3. Farbe / Colour: blau / blue. Constructeur: AUTOart. Manufacturer: AUTOart. Typ: Juke-R 2.0. Il est possible de collecter des objets pour max. Type: Juke-R 2.0. Türen zu öffnen. Marke: Nissan. Formula one 1:18. AUTOart Rennsport Nissan. Fabricante: AUTOart. Tipo: Skyline GT-R (R32). Plain Body Version 1992. Factura con IVA. Artículos bien protegidos y embalados. Sus ventajas. tarjeta de crédito. Nissan Skyline R34 GTR S-Tune Silver. 1:18 Autoart. New in box.